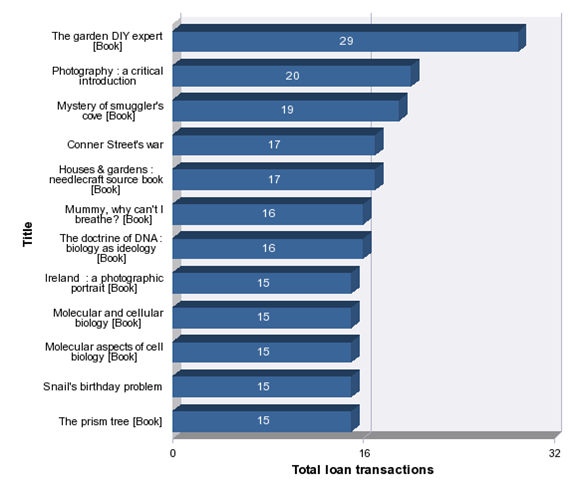 I promised to illustrate an example of a Talis Decisions report on the top 10 most popular works. Here are a couple of ways of doing it. 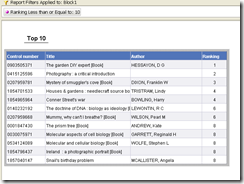 I am indebted to Sharon Jamieson of Aberdeenshire Library and Information Service (ALIS) for the second of these; the ALIS example uses Talis Decisions XI version 3. Both examples use the Circulation Universe. 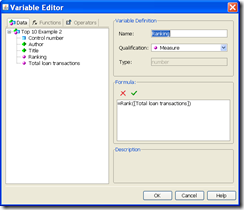 Create a variable. You can call it anything that you like: I called mine Ranking. 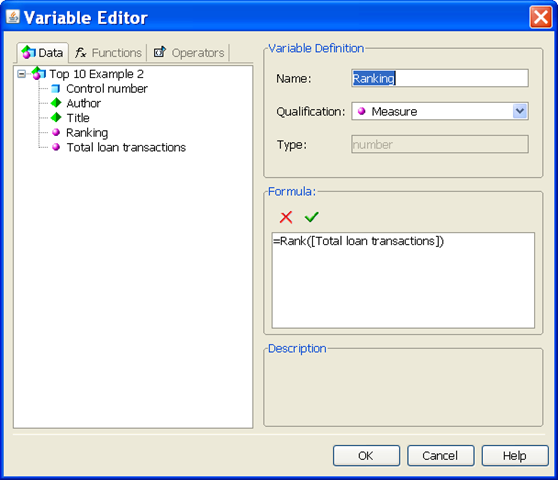 Set the variable equal to =Rank([Total loan transactions]). 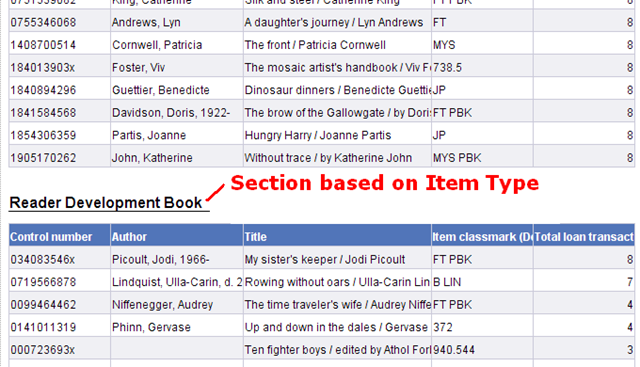 … and finally add a filter to the table to display only those records where the ranking is less than or equal to 10. It is possible to produce the same data in graphical form, although the detail of this is probably a bridge too far if this post is to be kept within reasonable bounds. Clearly the exact subdivision will vary according to local preferences. 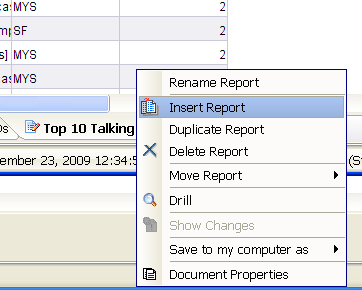 Each report, (or a section within the report – authors choice) has a filter. This is accessed by clicking on the filter button (red ring), selecting the block or section you want to filter and dragging the data item that you want to filter on into the filter area (red arrow). 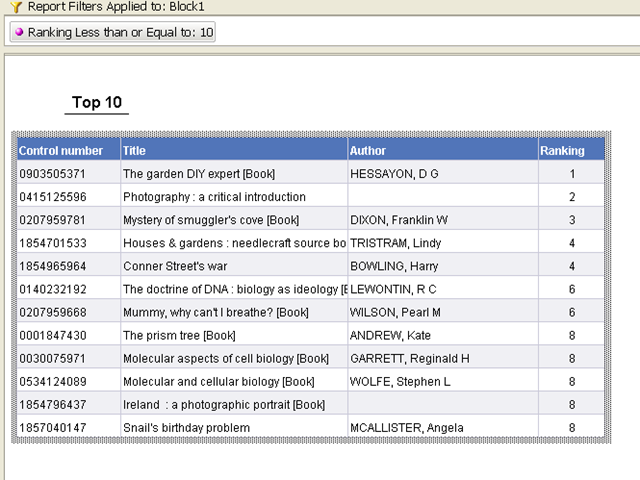 The report so far will not have just the top 10 in it, but all records. In the latest version of Talis Decisions, you can select a table and use the Rank dialogue to limit the results returned just to the top 10. There are two potential traps with both examples. 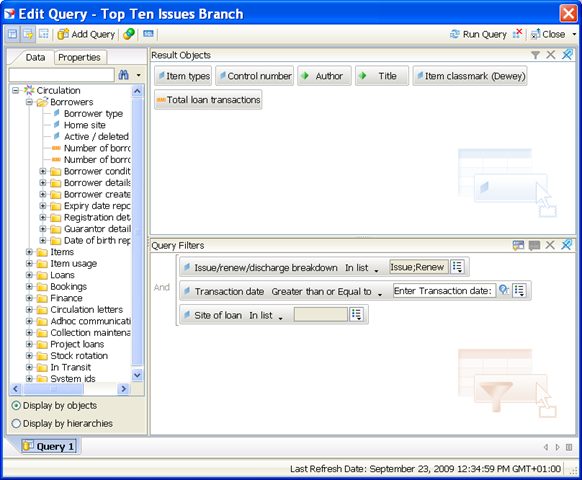 The first relates to the size of the query. 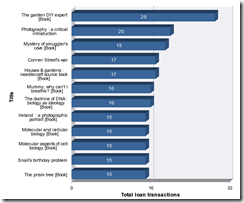 For this report to run in a reasonable length of time, the (Loan) Transaction Date should be included in the query filter and must not be set too long in the past. If in a large library you attempted to run this report over (say) five years, it would probably run for a very long time. 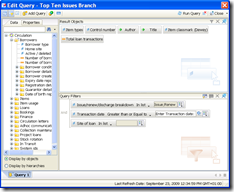 If limiting the date does not have any apparent effect on the time that the query takes to run, then there is probably an issue with your Talis Decisions installation (such as a missing index): you may wish to contact Talis for more help. 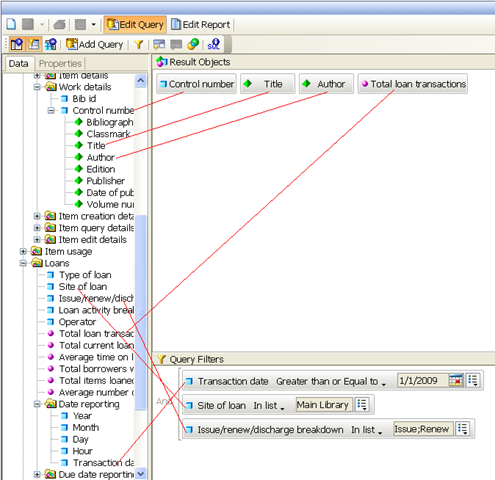 The second issue relates to accidentally excluding data. 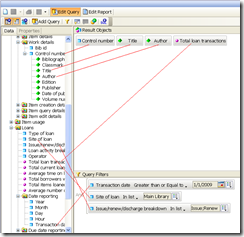 In the first example, the inclusion of Item Class mark from the Item Conditions class in the query will limit the data returned to items that have a Class mark. If an item doesn’t have this, it will not appear in the results. This may not be an issue for you but can be a problem if your data are incomplete. Note too that ALIS reported an obscure anomaly with timeouts in the software. 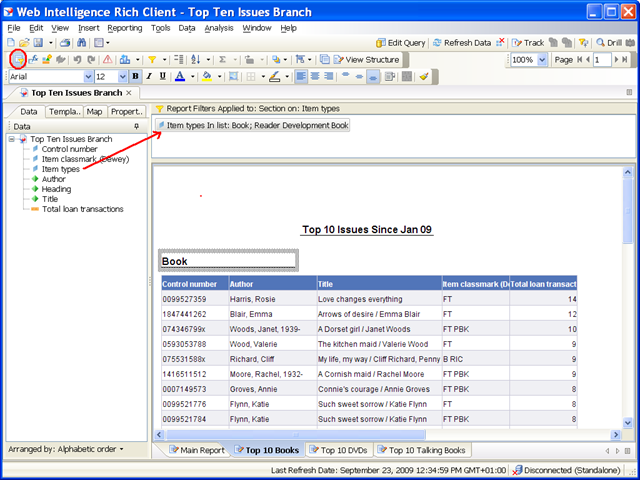 This may not be general, but their experience was that the query as described ran with no problems in either Desktop Intelligence (Deski) or Web Intelligence Rich Client: but if using Web Intelligence within Infoview the query timed out if the Ranking was used with the Site of Loan in the Query filter. It was OK with either one, but not both. This is a long post, but even then can’t substitute for formal training materials. Please do let us know (by commenting on this blog, or e-mailing me) whether it was useful. For more information on how to use Talis Decisions, see the Training and Videos pages of the website. The Videos page for example has a 5 minute introduction to filters. Key Performance Indicators (KPIs) are a term which is used a lot in the context of Management Information. I have mentioned them in an earlier post in the context of the “Balanced Scorecard”. I also listed the KPIs used by the new Lee Kong Chian reference library in Singapore. 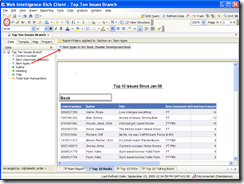 KPIs are important for report design in that, in an ideal world, most standard reports in the library would have an implicit or explicit link to a KPI or KPIs. 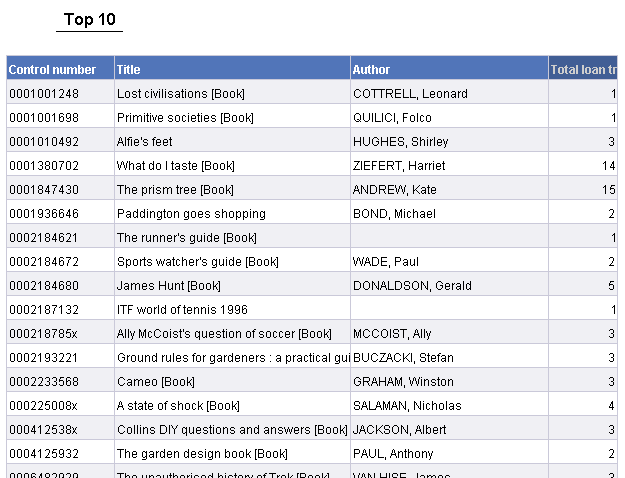 Many organisations suggest target KPIs for libraries: I’ll review some in a future post. For those who do not know them, the Gartner Group are a highly-respected commercial Information Technology (IT) research organisation. They even have their own channel on Youtube. Other commentators (here and here) have echoed or re-interpreted these ideas. Stripped to their essentials, the suggestion is that we are quite good at repeatable processes to collect data and produce reports on performance, but much less good at applying the intelligence gleaned from those reports in a repeatable way. The analogy (which is not used in the Gartner paper itself) is of the last mile from a telephone exchange to an individual house or business which is often a bottleneck in telecommunications. Gartner suggest some possible technological aids for helping out here, but the report once again emphasises the need to understand what a report is to be used for, and how it is going to be used: (in other words the workflow which it will fit into) before going to the trouble and expense of producing the report. 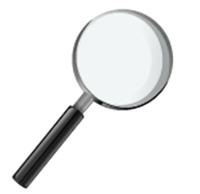 This is an area that Talis can help with too in the form of process consultancy. As ever, have a word with your Account Manager if you would like to find out more. 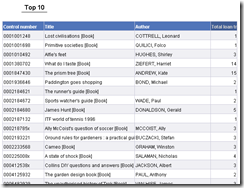 Marketing the Library through Facebook? There have been a number of articles and papers recently about using social networking sites such as Facebook for marketing the library. There are some extremely powerful considering this: most students will have an account on Facebook, Bebo or one of the other networking sites (probably Facebook). 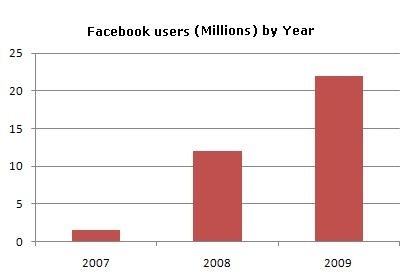 According to data from comscore, Facebook had around 1.6 Million UK users in Jan 2007, 12 Million in Feb 2008 and 22 Million in Feb 2009. Between June 2008 and June 2009 the number of UK Facebook users in the UK in the 15 – 24 year old age group increased by over 50%. Of course it might be a bubble, a trend that will go up like a rocket and down like the stick. But it might not. There are already a number of papers around suggesting that such sites might be useful for marketing purposes by libraries. 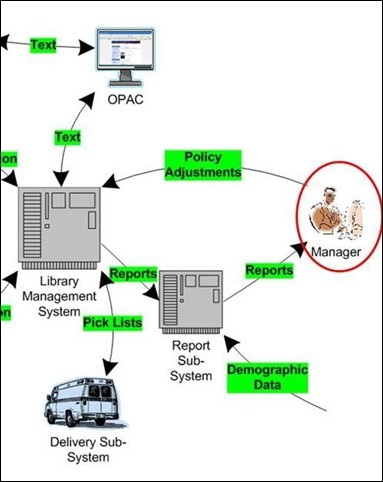 Examples include a paper written by David Xia and published in Library Management (Volume: 30 Issue: 6/7), and an earlier case study published by LASSIE: “Libraries and Social Software in Education”. Marketing (like any activity) is expensive. An early decision, for any library that choose to go down this route, will be to decide how to monitor the effectiveness of any expenditure in this area, bearing in mind that positive returns may require investment in time and and the accumulation of experience. In the last 20 years I have looked at dozens (maybe hundreds) of different bits of software designed to support the production of Management Information. The interesting thing is that they all demonstrate well. 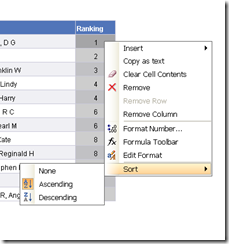 The formula is invariably a simple database with fairly small amounts of data, a little dragging, dropping and clicking and – hey presto! 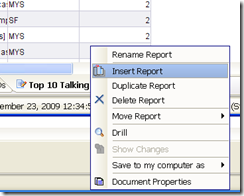 – a report produced by the salesperson in moments. The real world is more challenging than that. Underlying data structures can be complex and even messy. Years ago I was doing some work for a large retail bank. 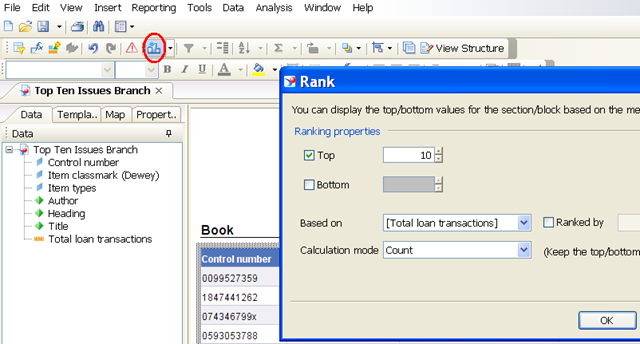 Their core banking system had a view of a customer who could have a number of accounts. Their Credit Card system on the other hand had no concept of a Customer. It was based on card numbers – the “customer” was just a name associated with a card. The management wanted a holistic view of their customers. The customers wanted all their dealings with the bank on one sheet of paper. The bank spent millions on a specialised Management Information system and even then only partially solved the problem. 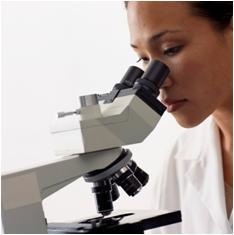 Depending upon working practices, the data available may be incomplete or inaccurate. Hospital Patient Administration Systems (PAS) may contain accurate administrative data (who was admitted when for example) but the diagnosis and treatment data on them are in general woefully and notoriously inaccurate. This is a result of the way that the data are recorded. In one case that I came across a “URTI” (Upper Respiratory Tract Infection) had been coded as a “URT” (Urinary Tract) infection. There isn’t always an easy answer. Software powerful enough to answer all the questions that need answering may not be cheap to buy or easy to use. Software that can be used by anyone may not be up to tackling the hard questions. Please let us know how well you think we are doing with this balance in Talis Decisions. Do comment on this blog or e-mail me at jlgh@talis.com.